Who Else Wants to Make Money [6-Figures+] Online Blogging? Are you serious about learning how to make money online? Do you have any idea what you want to SELL or who you want to serve? Because the bottom line to making a full time income online – all boils down to MASTERING the art & science of SELLING something to somebody. Unless of course what you are really looking for way is a way to ‘get rich quick’ – which, if that is the case, you might as well go look somewhere else because you won’t find it here. For example, back in August 2010, I joined a program set up to teach frustrated network marketers how to generate leads, sponsor more reps, train and motivate their teams to do the same thing using a proven online attraction marketing model. The cost was $49 a month and they also offered an affiliate program that pays 30-50% commissions. I needed to learn how to SELL the MLM business opportunity and the products the MLM company offered. Call it sponsoring, recruiting, word-of-mouth-marketing, referrals, sign ups. Doesn’t matter. If you are serious about learning how to make money online… the first step to realize you need to really learn how to SELL online. Which means you need to be clear on exactly what it is you have available to sell. How will your life be different when YOU start raking in an extra $100… $500… even $1,000 (or more!) each and every day when you finally crack the code and learn how to make money online? Will you be driving the same care? Will you continue to work at the same job? Go ahead. Dream again. Because if you are absolutely serious about taking back control of your life and finances – building a profitable business online could very well be exactly what you have been looking for. Hi, my name is Rob Fore. Since 1996, my wife Lisa and I have built numerous six-figure, even multiple six-figure business working part-time in our spare time online. Have a team of over 11,000 active network marketing distributors worldwide. We make tens of thousands of dollars each and every month – pretty much on complete autopilot. In fact, we often just shut off our computers… pack a bag… take a cruise or an extended vacation and the money keeps flowing in. Multiple streams of income that create a flash flood of cash flow straight to the our bank account. And now it is YOUR turn. Let’s get started, shall we? 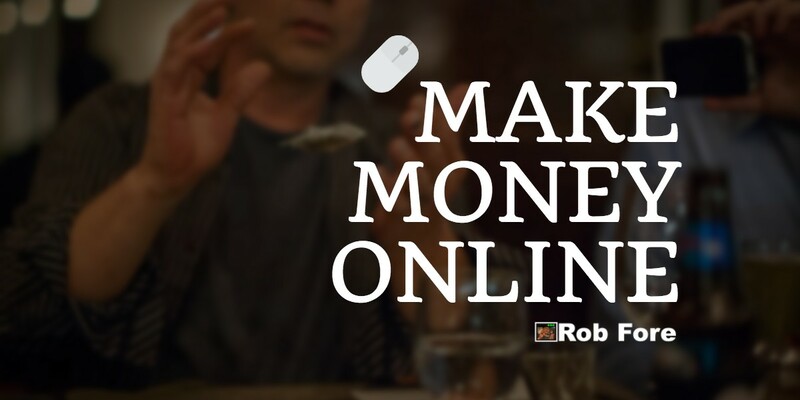 Understand there is no fast or easy way to “make money online” – despite what you may want to believe. There are no one-click wonder programs that will make you a fortune overnight spamming Facebook, Twitter, LinkedIn, Youtube, Craigslist or Pinterest. And while there are a few programs that will build INSTANT affiliate sites, video blogs and even give you an exact copy of a proven campaign – NONE of the programs are designed to drive traffic to those pages, posts and videos… and, without traffic, you’ve got nothing. Without traffic from people actively SHOPPING and SEARCHING for whatever it is you are promoting, you will never make a dime. You can have the exact same web site as me… selling the same exact product, service or home business opportunity… and if you don’t get traffic to your web site – you will not make a dime. Just because you build it DOES NOT mean people will come. Which is exactly why most people never really get off the ground with internet marketing. They forget the “marketing” part of the equation. Most of the big money names you might recognize online make the majority of their income selling their own products. These might include info-products (training), software programs (tools) and even high end coaching packages at live event. increase the number of times a customer buys from you. Promoting you own products makes sense if you have the time, talent and expertise to pull this off because you stand to make 100% of the income generated by all the sales generated – which is significantly higher than the commissions offered by most mainstream affiliate programs. In other words, you get paid to promote other people’s products and services – with normal commissions ranging from of a low of 4% (Amazon pays a 4-8% commissions based on volume of sales) all the way up to the new breed programs offering 70% commissions (which we will talk more about here in a minute because getting paid 100% commissions is can actually be MORE PROFITABLE, if you do it right, than selling your own products and services)! MLM is a business model that pays you a commission for direct product sales, plus the opportunity to recruit or sponsor other business builders on your team where you can then earn a tiny commission when purchase, consume or sell products and services. Fortunes have been made in the network marketing arena and it works. But it takes time and “the secret” all boils down to being able to consistently introduce the business to new prospects on a consistent basis over an extended period of time. Think leads, more leads and even more leads. Figure 3-5 years of constantly promoting your new MLM business to hit a solid six-figure income on the low end and 7-10 years of effort on the high end. The benefit of building this type of business lies in the “residual, leveraged income” model. You make a sale once and get paid multiple times. You can also get paid on the efforts of hundreds, thousands, even tens of thousand of people who become active on your team. Back in 1996 when Lisa and I first started online, we sold our products to real estate agents and brokers and it worked. Within 18 months we were pulling in a six-figure annual income. But then the economy changed and our business began to become less profitable. So we ADDED affiliate marketing to the pile and started promoting products offer by Amazon and eBay. What we would do is build a simple 5 page website and promote just one or two products from that web site and promote it to rank on the first page of the major search engines when people were actually SHOPPING for that product or service. But because of we were being paid TINY 4-8% commissions – we had to build a lot of sites and eventually had a network of over 800 affiliate marketing blogs that each brought in an average of just $14 per month net profit. Figure $14 times 800 site and, yes, we were making a significant income – but it became a full-time job just to manage all the sites and we got into this to create true time and financial freedom – not just another job for ourselves. So THAT distinction led us to join a network marketing business which offered the potential of earning money based on other people’s efforts and, today, we have a team of 7,000 active distributors in one company and a team of 8,600 in yet another company. But it took YEARS to build these up to a nice six-figure residual income. During those YEARS… we focused on making money through affiliate marketing and selling our own products to ATTRACT the people most likely to have an interest in our PRIMARY PRODUCT… which is one of our MLM business opportunities. Check it out what we are doing and if it makes sense for you and your family… let’s make the money-making magic happen together.